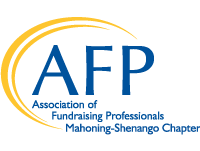 The AFP Mahoning-Shenango Chapter (AFPMASH) supports local fundraising professionals through education programs, networking, and other activities. Our Chapter members are from Mahoning, Trumbull, Columbiana counties in Ohio and Mercer, Lawrence counties in Pennsylvania. THEREFORE BE IT RESOLVED that AFPMASH is committed to diversity as an ongoing proactive process in its governance, committees, membership, programs and activities.